First, we visited a high school in Mae Chaem. We arrived just as the students were having a morning assembly. We were invited to the front and asked to introduce ourselves. It was here we learned that my oldest daughter has an irrational fear of speaking into a microphone and we have been making fun of her about it ever since. In the classroom, we introduced ourselves again (this time without a microphone, so Sierra didn’t freeze up). The girls also said their ages in Thai and the students cried out in delight when they learned that Kali and Arwen were close to their own ages. “Ah! Sip song (12), Sip see (14)!” they shouted. Instead of lessons, songs, and games, these students needed practice having conversations in English, so the students were divided into groups with a BYUH student leading each group. My girls each joined a group. The BYUH student would spend 15 minutes having a conversation with their group and then rotate to a new group. My girls enjoyed finding out that these teenagers in rural Northern Thailand have many of the same interests that they do. The dances were hilarious. Some were just bad. Others had dance moves that were inappropriately suggestive, especially given the English lyrics of the songs (that presumably no one understood). And some of the dances were actually kind of good. 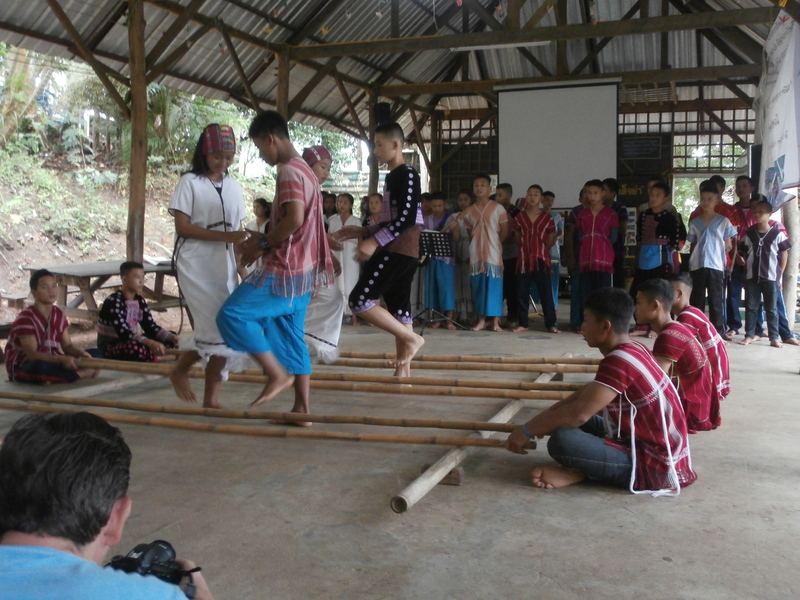 The high school up in the Karen hill tribe area near Mae Chaem was also practicing for a Mother’s Day performance when we came to visit. 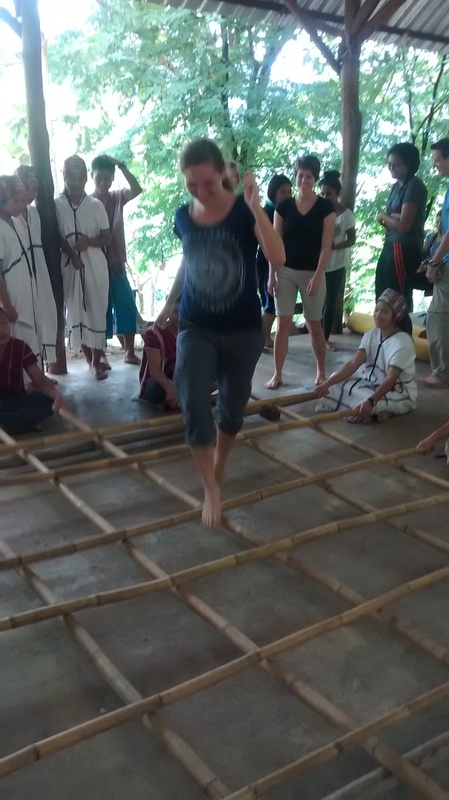 They performed several musical numbers for us and then showed us a bamboo pole dance. 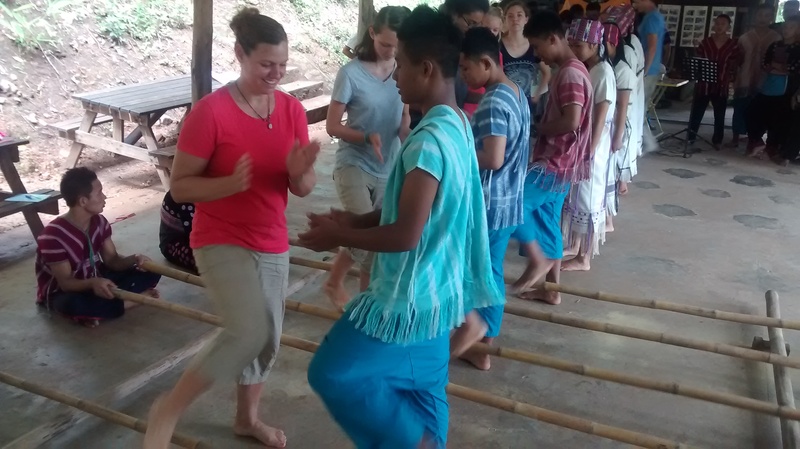 One group of students would step in and out of a cross work of bamboo poles while other students moved and tapped the poles in a rhythm. It was mesmerizing to watch. After the performance, we were invited to try the bamboo pole dance. I was pretty sure I was going to get my leg smashed or fall down. Luckily, they started with a slow rhythm and a simple pattern to help us get the hang of it. Later they added more poles and taught us a more complicated dance. The students were gentle with the poles when I messed up and never smashed my legs. And I only tripped a little once, which is pretty good for a klutz like me. 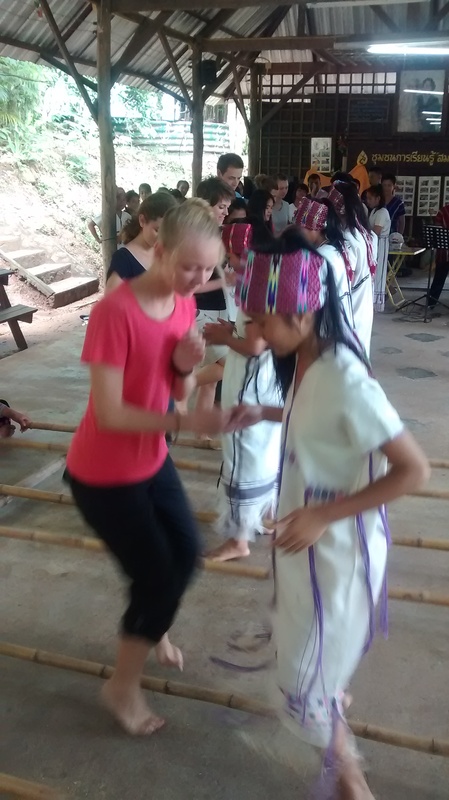 After they taught us a dance, the students wanted to learn an American dance. So we taught them the “Cha Cha Slide.” The boys really got into it, but the girls were timid. We found that unusual since it would have been the opposite in the US. After lunch, we practiced the “Cha Cha Slide” some more. They said they wanted to perform it for their Mother’s Day show. We never found out if they actually did. Then they invited us to help them with their afternoon work. One group when up the hill to plant something on the hillside. 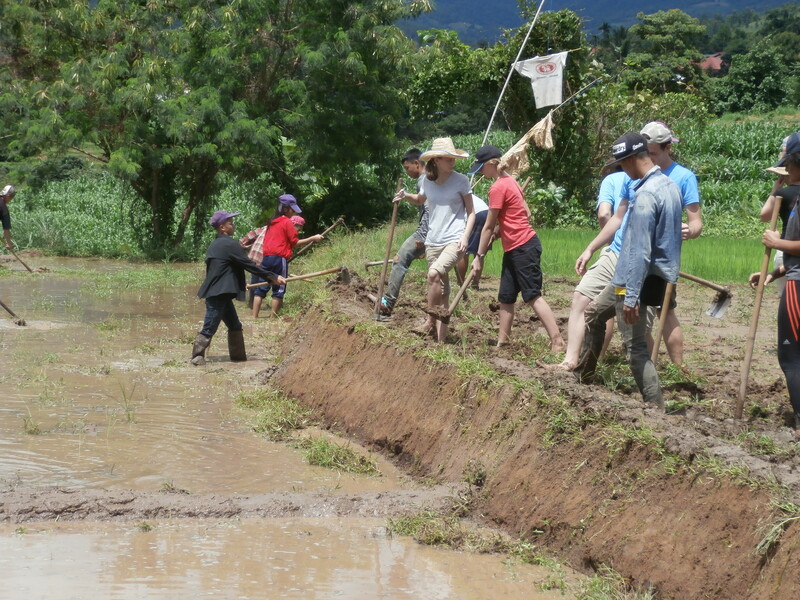 And the other went down to the rice fields to weed the mounds between the rice paddies and build up these banks with more mud. It was interesting to learn that the students participate in the area’s agriculture as part of their school day. Up the hill from our homestay was a Christian church. Next to the church lived a woman who ran a home for 39 children. Most of these kids live there so that they could go to school in Mae Chaem. A few were orphans. The BYUH students were asked come teach English to these kids in the evenings. 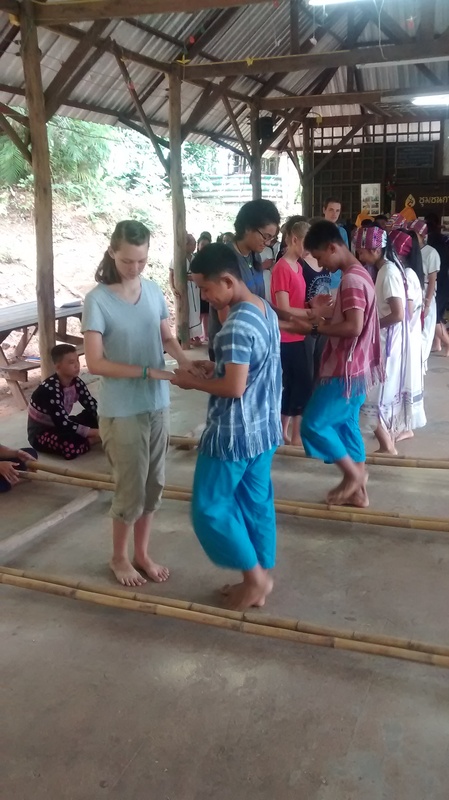 By the time we arrived in Mae Chaem, the BYUH students had already been teaching here for two weeks. They had divided the children up by age and were teaching each group in pairs. The girls and I offered to help with the tiniest kids who were a bit distracting to the older kids in their group. We sang songs and reviewed color and animal names for as long as we could keep the kids’ attention and then my girls just played with them. It was inspiring to realize that these little guys knew more English than I knew Thai. The BYUH students really bonded with these kids. On our last day, the church hosted a going away party for us. The children sang songs for us. We sang “Aloha Oe” to them. They presented us with handmade bags. A few tears were shed as everyone said goodbye. Once again we were privileged to get to know local people living in a small town in Northern Thailand. We learned that children and teenagers are very much the same whether they live in the United States or in rural Thailand. They like to play games and sing songs. They like sports and art. And all teenage girls shriek when they watch their friends perform a dance routine.